Previous Prev Feeling Better, Finally! The best part about being sick for a week was writing. I blogged every day last week! So, really, if your reading this and wishing me well, you might have to decide whether your care for my well-being as a human trumps your love for my incredibly witty style of writing. 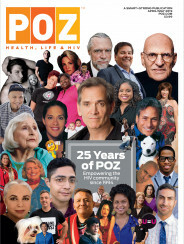 Which is on display in this month’s issue of Poz! I wrote a column called “Maybe Baby”, about the oft-asked procreation question, specifically whether Gwenn and I are interested. And no, that’s not our baby in the photo, but it is our Goddaughter, Evie. She’s guest-starred on Decker’s Daily many times, most notably in Episode 38 as my would-be assassin, after debuting a few days earlier in Episode 34. Aside from me, she’s logged the most Decker’s Daily appearances. Which is fitting, because when our good friend Lauren was pregnant with her, we spent most of the pregnancy in coffee shops. When she was born, we were at the hospital, and have seen her explore babyhood and life on this planet for the last 9 months. Lauren just had a birthday, and as you’ve seen before, I have a knack for making cool YouTube cute baby vids. My first work, When Babies Have Babies, feature my niece, Katelyn. Then last Christmas, my second niece, Helayna, debuted in the sorta sequel, When Babies Save Christmas. Inspired by those earlier works, I made this for Lauren, changing a Happy Birthday text to a plug for Lauren’s music, which I love. So, without further ado, here’s Interplanetary Travelers, starring Evie and Lauren Hoffman. Enjoy the ride! See Shawn’s band play in Charlottesville on July 11!